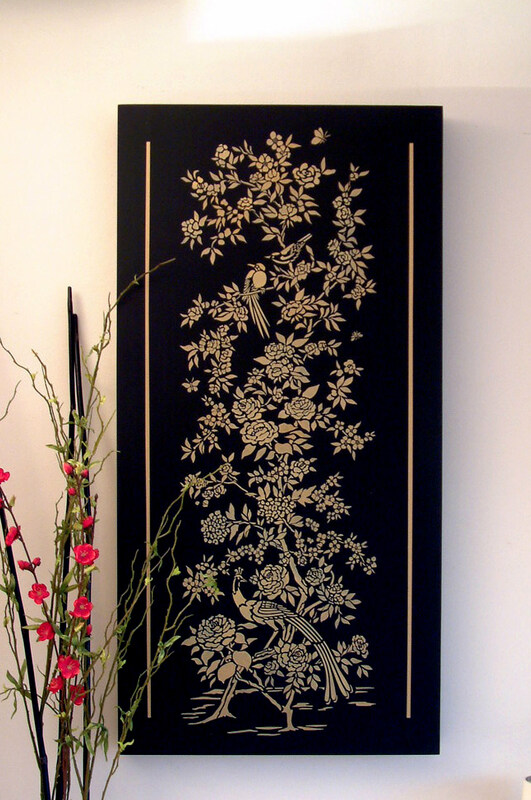 The Small Chinoiserie Stencil is a beautifully detailed, high quality stencil. 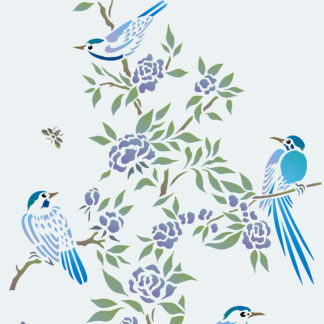 Our beautiful Chinoiserie stencils are based on classic 18th century hand painted silks and wallpapers – depicting trees, full blown roses, blossom sprays, exotic birds and bugs. 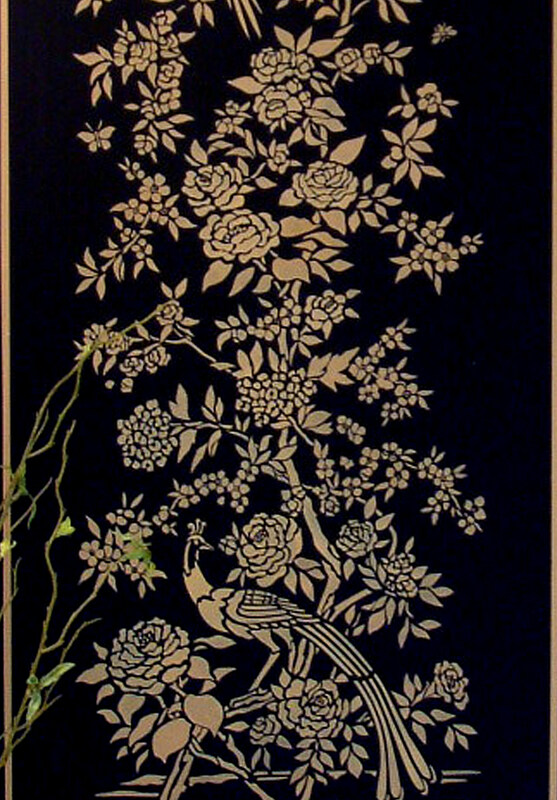 The Small Chinoiserie Stencil is perfect for decorating cabinets and smaller wall panels, blinds and for fabric creations! 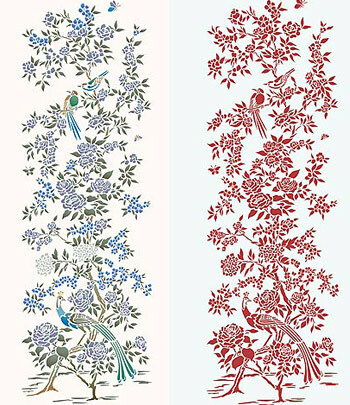 The Small Chinoiserie Stencil is a smaller version of the large Chinoiserie Stencil 2. See size and layout specifications below. 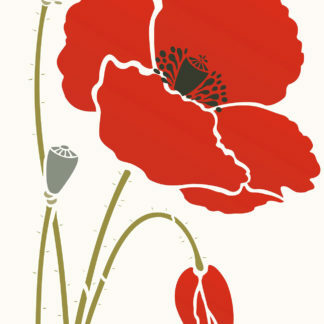 Stencil in simple single colours – such as white onto chalky blue or navy; or stencil in colours that emphasise the different features of the design. 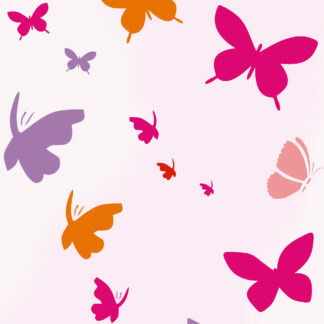 Classic colourways for this type of effect include pinks, reds, greens and yellows on duck egg blue or aqua backgrounds. 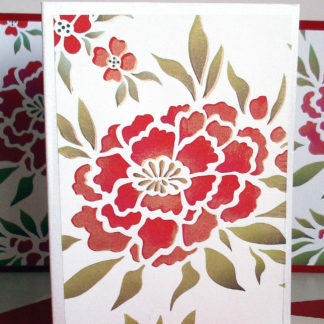 Or create oriental style using Metallic Stencil Paints on black or red backgrounds. Above top and below – Small Chinoiserie stencilled in Nougat Stencil Paint and over-stencilled with Antique Gold Metallic Stencil Paint, with lines added to sides by painting Antique Gold between strips of Painting Tape. Below – close up detail of this effect. Above – close up of decorative panel. 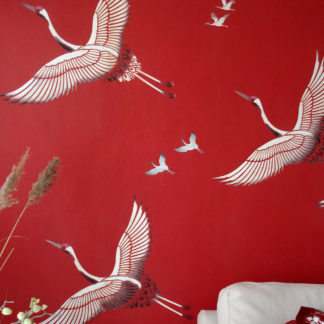 See also the large Chinoiserie Stencil 1 and Chinoiserie Stencil 2. 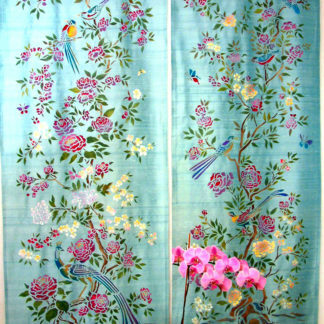 Above – Small Chinoiserie Stencil on a pale aqua background. Left – in Raspberry Stencil Paint, right – in Eucalyptus Stencil Paint. 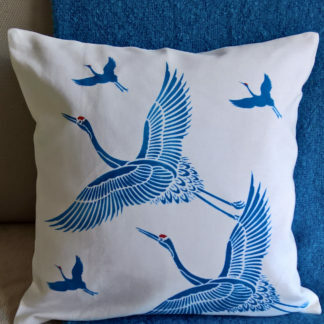 Above – Small Chinoiserie Stencil in the soft tones Eucalyptus and Persian Blue Stencil paint on a pale blue-grey background. 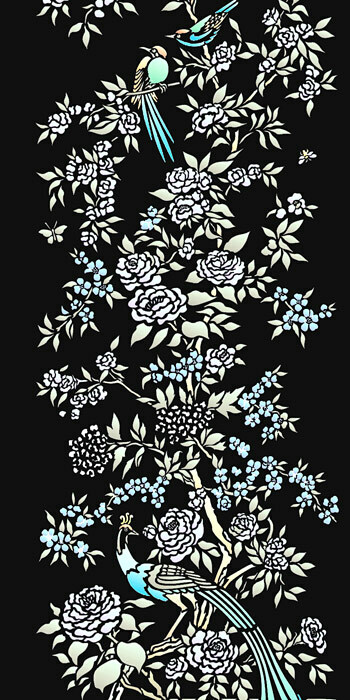 Above – close up of the Small Chinoiserie Stencil in Ice White, Nougat, Chinoiserie, Paradise Blue and Spearmint Stencil Paints on a rich black background. Above left – Small Chinoiserie Stencil in Eucalyptus, Mocha, Kingfisher, Cyan, Morning Glory and French Lavender Stencil Paints. 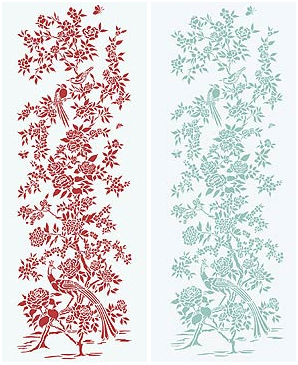 Above right – Small Chinoiserie Stencil 2 stencilled in Raspberry Stencil Paint on a pale aqua background. Detailed one layer stencil on one sheet. The height of the design is approximately 81cm (31 3/4″) by approximately 28cm (11″) wide. 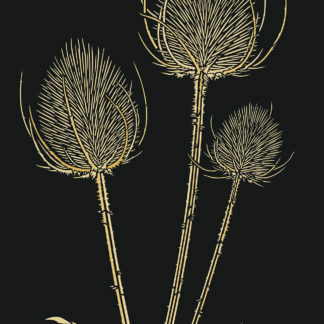 Left – layout of the stencil sheet of the Small Chinoiserie Stencil.